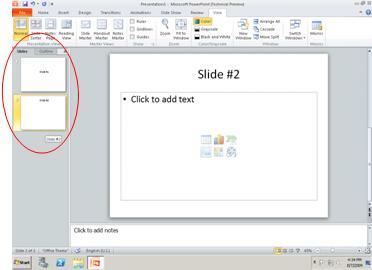 To add a slide that contains the content of an existing slide in a presentation, you can duplicate the slide. 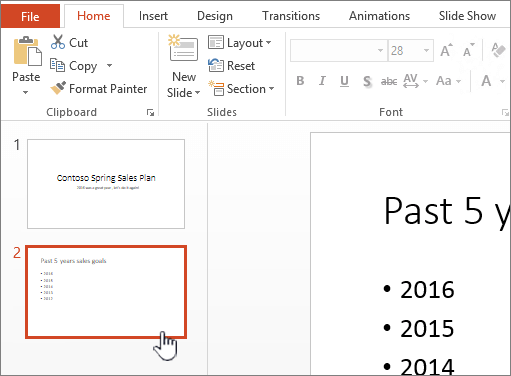 Important: If you need paste recovery, which allows you to keep the formatting of the duplicated slide's content, you will want to copy and paste your slides. In Normal view, select the slide thumbnails of one or more slides that you want to duplicate. To select multiple slides, click a slide thumbnail, and then press and hold Ctrl while you click the other slide thumbnails. On the Home tab, in the Slides group, click the arrow next to New Slide, and then click Duplicate Selected Slides. The duplicated slides are inserted directly underneath the lowermost slide that you selected. In the pane that contains the Outline and Slides tabs, click the Slides tab. Select one or more slides that you want to duplicate. To select multiple slides, click a slide, and then press and hold Ctrl while you click the other slides. Note: The duplicated slides are inserted directly underneath the lowermost slide that you selected. Select one or more slides that you want to duplicate. On the Home tab, in the Slides group, click New Slide. 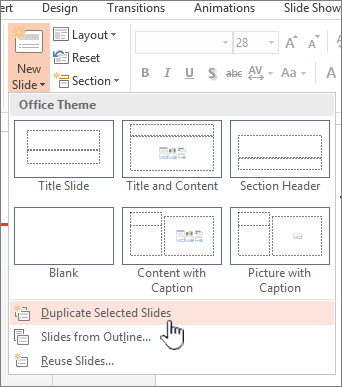 In the layout gallery, click Duplicate Selected Slides. Note: The duplicated slides are inserted directly below the lowermost slide that you selected.